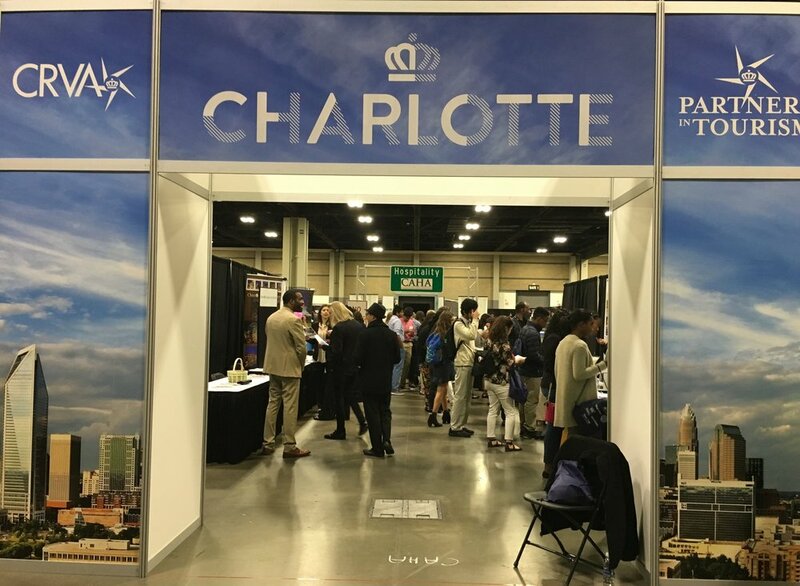 Represented by 10 member hotels, the Charlotte Area Hotel Association participated in the City of Charlotte’s Career Discovery Day on April 17th at the Charlotte Convention Center. Participation is part of our ongoing initiative to introduce and educate the next generation of employees about careers in the Charlotte hospitality industry. 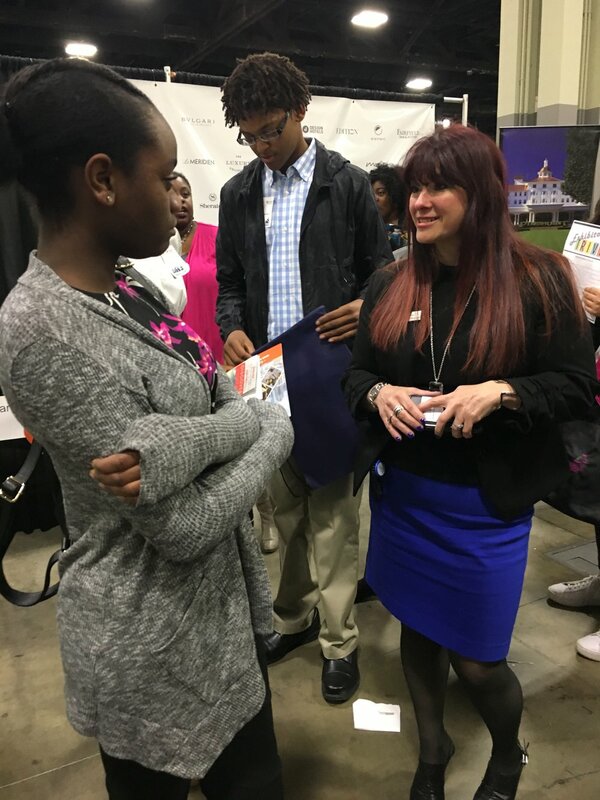 More than 4,000 students looking to enter the workforce representing 36 Charlotte Mecklenburg Schools were exposed to several “Industry Zones”—Hospitality being one of the few private-sector zones among the more than 100 vendors. Big thanks to the CRVA for lending us the “Partners in Hospitality” archway, which helped Charlotte's hospitality industry stand out in a crowded hall. CAHA member hotels displayed career opportunities with the students who are hungry to find their path. The message was consistent throughout the day—hospitality is the industry of upward mobility; come in with a good attitude and willingness to work hard, and you can create a successful, long term career. Moving forward, CAHA has several plans in place to strengthen its' hospitality jobs initiative. An employee recruitment video, filmed locally last month is in the final stages of editing. It features young hotel employees, all in supervisory or managerial roles, who shared personal experiences of upward mobility in the hospitality industry. All started in line positions but found opportunity and training to progress in their careers. "The best way to share an upward mobility story to young adults is for them to hear from young adults who are not too removed from initial career decisions," said Vince Chelena, CAHA executive director. "We captured stories from amazing employees who truly believe they have found a career in hospitality. Through a partnership with CMS, graduating students will be exposed to the hospitality industry as a great place to work and grow professionally." If you were not able to participate in the Career Discovery Day this year, there is another opportunity on the horizon to showcase our industry to the next generation of young leaders. The Mayor’s Youth Employment Program will be hosting their Summer Kickoff Event in June at Spectrum Arena. Executives from different industries will be present to coach students on interviewing, career readiness training, and other career building skills. CAHA will again be represented through its' member hotels. More information about the job fair will be coming soon. "We tip our hat to the Mayor’s Youth Employment Program and CMS for putting together an incredibly successful event," said Chelena. "We look forward to continuing our partnership with both organizations and introducing students and career seekers to Charlotte's hospitality industry."